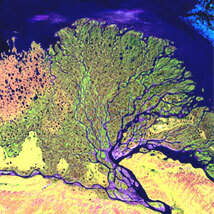 LandSat image of the Lena Delta Reserve, which is the most extensive protected wilderness area in Russia. Image courtesy of NASA Landsat Project Science Office and USGS EROS Data Center. Used with permission. Earth as Art is D-Lib Magazine's featured collection this month. IPSI-2005 HAWAII, 6 - 9 January 2005, Big Island Hawaii, Hawaii, USA. Call for papers. The abstract submission date is 1 September 2004. The Sixth Australasian User Interface Conference, 31 January - 3 February 2005, Newcastle, Australia. Call for papers. The submission date is 3 September 2004. 2005 IEEE International Conference on e-Technology, e-Commerce, and e-Service, 29 March - 1 April 2005, Hong Kong, China. Call for papers. The abstract submission date is 28 September 2004. Museums and the Web 2005, 13 - 16 April 2005, Vancouver, British Columbia, Canada. Call for papers. The submission date is 30 September 2004. The 25th International Conference on Distributed Computing Systems (ICDCS), 6 - 9 June 2005, Columbus, Ohio, USA. Call for papers. The submission date is 1 October 2004. 2005 SIAM International Conference on Data Mining, 21 - 23 April 2005, Newport Beach, California, USA. Call for papers. The submission date is 4 October 2004. IPSI 2005 AMALFI, 17 - 20 February 2005, Amalfi, Italy. Call for papers. The abstract submission date is 17 October 2004. IEEE/WIC/ACM International Conference on Web Intelligence 2004, 20 - 24 September, Beijing, China.